This review has been printed in the February 2015 issue of Chess Life. A penultimate (and unedited) version of the review is reproduced here. My thanks to the good folks at Chess Life for allowing me to do so. Franco, Zenón. Anand: Move by Move. London: Everyman, 2014. PB 376pp. ISBN 978-1781941867. List $29.95; currently $23ish at Amazon. Lakdawala, Cyrus. Carlsen: Move by Move. London: Everyman, 2014. PB 432pp. ISBN 978-1781942079. List $29.95; currently $25ish at Amazon. You’ve got to hand it to the guys at Everyman Chess. They know an opportunity when they see one. With the 2014 World Championship fast approaching, and with no titles on the combatants in their catalogue, Everyman asked two authors – one of their most prolific, and one of their newest – to remedy this most unfortunate situation. The books under review this month, out just in time for the match, are the fruit of those labors. Both should also be available in e-book format by the time this review goes to press. For Carlsen: Move by Move, Everyman turned to its most indefatigable author. International Master Cyrus Lakdawala has penned 21 titles (including forthcoming books) with Everyman since 2010, six of which are focused on a specific player. Carlsen: Move by Move is structured like most of Lakdawala’s biographical works for Everyman, with 54 annotated games divided into six thematic chapters. This personification of pieces is relentless and tiresome. What’s worse, some of Lakdawala’s ‘metaphors’ seem confused or nonsensical. In Carlsen-Caruana (Biel, 2011) – game #32 in the book, from which all the above is taken – we encounter a typical example of this shtick gone awry. Carlsen has just played 25.f4?!. Caruana might have responded 25…Ne3!, of which Lakdawala writes: “the knight inserts his head into the lion’s mouth, hoping he has been well fed.” If the hungry rook takes the bishop with 26.Rxe3 (White’s only move), Black has 26…Bxf4 with compensation. Caruana blundered in the game with 25…Re6? 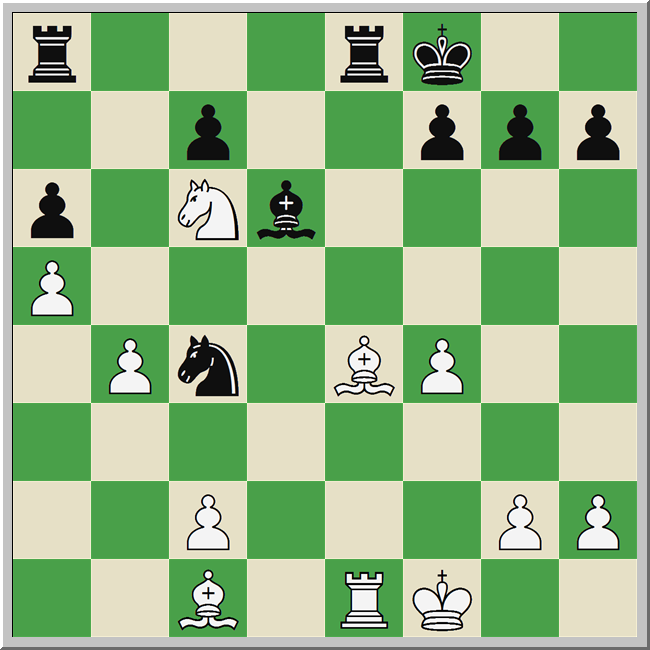 ?, allowing White to trap the knight by placing “calming hands” (???) on the rook and bishop with 26.Bd5. Lakdawala’s analysis is decent enough, although he, like many authors, seems to lean on engines a bit too much. He can clearly break down the essentials of a position when he so chooses. But what is valuable in Carlsen: Move by Move gets lost amidst the avalanche of bad jokes and vapid prose. Zenón Franco has done a much better job with Anand: Move by Move. The Paraguayan Grandmaster, having already published on Anand (Viswanathan Anand – Quíntuple Campeón del Mundo, 2013), has written a relatively straightforward biographical work. Anand: Move by Move begins with a twenty-five page assessment of Anand’s style. Franco lauds Anand’s flexibility, noting his ability to change his playing style to defeat Kramnik (236) and Topalov (264) in World Championship matches. He goes so far as to compare Anand’s universality with that of Fischer (11) – no small compliment! The bulk of the book is 32 annotated games from 1991-2014, representing a decent cross-section of Anand’s career. Franco takes pains to situate each game both in terms of its tournament situation and its broader place in Anand’s oeuvre. The inclusion of a strong biographical narrative in Anand: Move by Move is most welcome. Unlike Lakdawala, who actually points to an unsourced Wikipedia quote to prove a point (Carlsen, 9), Franco references multiple sources in his text, citing Anand’s own words whenever possible. The analysis is comprehensive without being overwhelming, and Houdini’s presence is not onerous. Were this a competition between the two titles, a rematch by proxy, Anand would certainly have his revenge here. Poor Carlsen will just have to console himself with his champion’s crown. That the books are aimed at those interested in the match is obvious: see Carlsen: Move by Move, 9, and Anand: Move by Move, 368. This entry was posted in biography, Game Collections and tagged Anand: Move by Move, Carlsen: Move by Move, Cyrus Lakdawala, Magnus Carlsen, Viswanathan Anand, Zenon Franco on February 3, 2015 by fullcityplus.